I was berated by my daughter for not including pubs in the top 3 of my "10 Things I Miss Most About Britain". My daughter works, part-time, in an English pub. Alright, pubs may actually be the thing I miss most about Britain. But I didn't want to risk being labelled as a toper, dipsomaniac or habitual inebriate. According to what I hear, even the British will soon be missing British pubs - they are closing at an alarming rate. Why are pubs going out of business so frequently? Some say the smoking ban has discouraged people from going to their local. Others blame the new generation of drinkers who prefer "clubbing" to "pubbing" and the giant supermarkets who sell cut-price booze alongside bread and milk. Public houses started, hundreds of years ago, as a cottage industry in which local residents brewed high quality beer on their own premises and opened their doors to neighbours. Successful brewers grew into commercial operators and delivered their product to public houses on a horse-drawn dray cart. Casks of live ale were rolled into a cellar where they rested for a day or so to allow the yeast to settle. Beer was delivered to the bar room in jugs or pumped by hand through pipes from the cellar. Following the Second World War many small breweries were swallowed up by big corporations. The big corporations did what big corporations are meant to do - make more money for their shareholders. There are two ways to make more money. Sell more beer and make beer more cheaply. They did both splendidly well. Lots of new pubs opened and beer was made more cheaply. Aluminum kegs full of pasteurized, dead beer handled better than oak casks full of live beer. But it didn't taste so good, so the big brewers spent millions promoting beer sales through image advertising. Handpumps started disappearing from bars; replaced by taps that allowed carbon dioxide to squirt tasteless, dead beer through a chiller into the customer's glass. It worked - for a while. Then came a backlash from consumers. CAMRA, the Campaign for Real Ale started with a few beer enthusiasts and quickly grew into a major, powerful consumer group. Smaller breweries started to spring into life again and "real ale" (unpasteurized beer dispensed without carbon dioxide pressure) grew in popularity. Things looked good for a while but then along came "binge drinkers". Mostly younger drinkers who use alcohol as a drug to get a party night high and "lager louts" who disrupt football matches. Urban pubs lost their appeal and some of their business. Supermarkets started selling large amounts of beer, wine and spirits. Who needs to go to the pub when you grab a bottle of giddy juice along with your groceries? Pubs responded by innovating. "Gastropubs" sprung up serving high quality food. Pubs almost became restaurants. Then the smoking ban was imposed. Customers left in their droves. Then along came the global economic downturn and many people slashed their personal entertainment budgets. These are dark days for the traditional British pub. Hundreds of years of tradition hang in the balance. The British pub is not - and should not be - a restaurant. The British pub is not - and should never be - a nightclub for binge drinkers. The British pub should be and I hope, at least somewhere in the Land of Hope and Glory, always will be a meeting place. A place where you can buy a glass or two of dark brown beer to wash down a ploughman's lunch. A place to swap tales, to converse with a friendly landlord, a place to belong, a place to sing, to play darts and dominoes and a place to meet and make new friends. 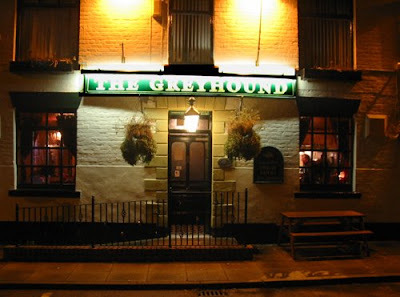 This blog post is dedicated to Shane and Kath of the Greyhound in Royton near Manchester, who are doing a grand job of fighting to keep the British pub alive. Cheers!